Go back to the Middle Ages, build a castle and attack your enemies! 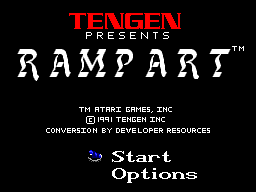 I can’t really think of another SMS game quite like Rampart. What makes it even better is that two people can play against each other, increasing the variety available from this game. Rampart is basically a strategy-type game where you select your fort, surround it completely with walls for protection, place as many cannons as you can manage to fit within those walls out of the cannons you are allocated, and then battle it out with ships who's job it is to destroy those walls. One type of ship carries troops which it can drop to shore if it gets close enough. These troops can destroy unprotected forts so they must be eliminated, either by surrounding them with walls, or using your cannons against them in battle mode. But perhaps the most fearsome enemy is the so called 'Flagships', red coloured ships which fire flaming cannonballs. These cannonballs render the spot they hit ‘dead’, so you can’t build anything on it. You start off by selecting a fort. All games start off in the same area, and there are three forts to choose from. Build your walls using wall pieces which look like Tetris pieces, then place your cannons, because it's Battle time! Try and sink as many ships as you can, at this early stage you only have to go up against the 'Gunships', which are easily sunk with only two hits. After battle mode ends (approximately 20 seconds), rebuild the damage caused by the ships. The aim here is to rebuild your castle and extend it, so as to provide as much enclosed space as possible for more cannons, because as we all know, more cannons equals more firepower. There’s always at least one other fort that you can add to your sprawling castle, for extra points. If you manage to surround at least one fort, battle mode will come up again and you can destroy any ships which were damaged in the previous battle but haven’t sunk, and sink any new ones. Once you collect enough points, which you get for surrounding as many forts as you can as and for destroying ships, you conquer that round and it's on to the next round. A map of the island will come up and you have a choice of three areas for Round 2. You will end up playing all three areas, as well as three more areas not on this island. The last three areas are two tracts of land (meaning two shore lines for more battle fun), and the final round is a tiny island with only two forts (and a lake! ), so ships come at you from all corners here! If you are too slow in surrounding a fort and the time runs out, you lose a chance to get to the next round. You have 3 chances before its game over. That's all for a one player game. Rampart can also be played by two players. Once you start a game, player two has some time to jump into the game, so instead of ships, player one battles it out with player two. 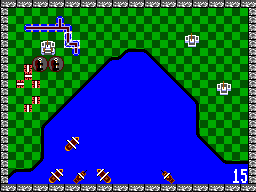 The map is divided by a river, with a player on each side. To tell you the truth I haven’t played the two player game that much, but I’m pretty sure there are variations on a river-down-the-middle level. 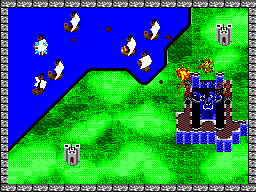 There are actually two types of graphics in this game; in the building mode, you are presented with a top-down view of the land and forts. The land is checkered with dark and light-green squares to aid in placing wall pieces and cannons. In battle mode, the landscape takes on a slightly 3D look; walls have height and the land has a contoured look, which adds to the atmosphere of battle. There are only 3 types of ships, each one is easily distinguishable from one another; you have your standard Gunship which is brown and has a single sail, then your Troopships which are slightly larger and darker with a double sail, and then your Flagships which are like Gunships but are red. Cannonballs are represented well, they get slightly larger and smaller as they fly through the air and hit their target. When a ship is hit it catches fire, as it takes more hits the fire increases until it finally sinks in a mass of flames, and this is represented with good detail. What I would have liked to see is smoke from flames and cannonball hits though. The water, too, could have used some more detail, instead of just being an expanse of blue. Music in this game is non-existent, except for when you manage to enclose a fort, and then you get a sort of 'victory' melody. Other than that, there's no background music, which can make the game seem a bit 'empty'; some music, especially during the battle scenes would have been nice. As for sounds, placing a cannon makes a sort of generic sound, and the cannon balls themselves make an explosion sound when they hit something. After a few rounds of playing it is pretty easy to get used to the controls. Button 2 is used to place wall pieces and cannons in build mode, and for firing cannons in battle mode. Button 1 is used for rotating wall pieces in build mode, and using Turbo cursor in battle mode (more on that later), which is selectable in the Options menu. Don't like this layout? Well then you can reverse the controls in the Options menu! Also in the options menu you can select ‘Turbo Cursor’, which when enabled, allows you to use Button 1 to speed up your cursor (which looks like the Union Jack) when in Battle mode. Trust me when I say you’ll want it to move fast, because it moves too slowly normally! Being quick is the key in the building mode, you only have 20 seconds to surround hat fort! My controllers aren’t as responsive as they could be, so I was fumbling a bit when it came to rotating and placing a wall piece in a good position. In battle mode speed counts too, you have to get that cursor positioned on an enemy ship’s position and hit fire before it moves away! There are three levels of difficulty, selectable from the Options menu. Plus when you start a game you can choose a Beginner or Veteran game. Veteran automatically starts from Round 2, as if you had won the first Round. Each difficulty level determines the number of cannons you get at the start of each game. The two player game also gives some variety if you get tired of sinking ship. With some appropriate music and some graphical improvements this game could have been even better, but as it is it’s a very enjoyable strategy game. With the option of one and two player modes, as well as the various difficulty levels for one player games this one should keep fans (and even non-fans) of strategy games occupied for a while, if at least just to beat your high score!